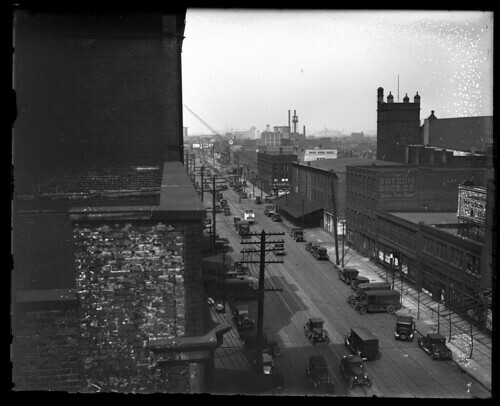 I recently obtained ten 4x5 glass plate negatives of Cleveland scenes, taken in 1927. Thanks to the assistance of Bill Barrow, Special Collections Librarian at Cleveland State University and the Digital Production Unit there I was able to get the negatives digitized at 1200 dpi. 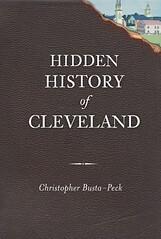 This provides a very high resolution look at these parts of Cleveland. In the first post in this series, I shared a few scenes that were reasonably familiar - the Terminal Tower, the Arcade, and Public Auditorium. In the second post, I shared two views of Central Avenue (now Carnegie Avenue) at East 14th Street. In this post, we will continue southeast, looking at an area that have been completely changed by the interstate highway system and the construction of Jacobs Field. It took me a long time to figure out where this photograph was taken. Unlike the other photographs, there weren't any obvious street signs or named buildings that are still extant. Finally, I saw two buildings in the distance that I knew - the YMCA and the Walker and Weeks building. Between the two, in the haze, one can also make out the outline of a church. From this, I was able to see that the photograph was also taken of Carnegie Avenue (at the time Central Avenue). The photographer appears to have been on the top of a building, on the north side of Carnegie, at about East 7th Street. In the distance, the water tower and smokestacks of the Independent Towel Company are visible. Near the right side of the image, a square tower with four small domes is Acme Hall. The Hall faced East 9th Street, the intersection of which is visible in the midground. A poster in the alley advertises a film of the fight between Jack Dempsey and Gene Tunney. On the right side of the street, underneath a billboard for Meadow Butter is the Sencabaugh Company, a grocery wholesaler. This view, still looking northeast, shows the intersection with Broadway. As a point of reference, the tower of Acme Hall is visible just behind the traffic light, in the middle of the intersection. The water tower of the coffee company that was visible in the second post can be seen here, from the opposite side. Finally, the Botzum Bros. sign that was visible in the previous photograph can just be seen above the far end of the streetcar. Note the interesting truck on the right, on Broadway, just about to pull onto (or cross) Central. I love these photographs, and I have already spent too much time looking at them and not working. 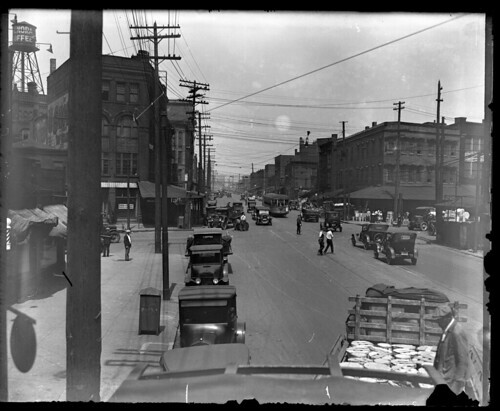 In the second photograph, the intersection is with E. Broadway (see the street sign in front of the building on the left that is Owen & Miller Fruits & Produce). Also, I am confused by the angle of the first photograph, and connot picture being able to see both Walker & Weeks and the YMCA from Central/Carnegie, but after looking at old maps, I do not have a better idea on a location. Your note regarding Broadway / Woodland is well taken - thank you for bringing that to my attention. I need to get some better maps on hand for looking at these things instead of constantly trying to remeber old street routes while looking at contemporary maps. The issue of the locations of the YMCA and Walker and Weeks buildings was quite a bit of annoyance for me, too. I drew up this little map in Google Maps to better illustrate the approximate perspective of the camera. The location of the Independent Towel Company solidifies this location. (By the way, I just noticed, according to Google Maps, that that building is now gone!) Hopefully this does a better job of explaining the camera location. Very nice pictures...I'd love to see more of Franklin Blvd within Ohio City limits if you have any. Nice work! I should point out that Joanne Cornelius is the ever-helpful, positive supervisor in Digital Production who was actually the one who made the scanning possible. I really like what you do with old photos like this, as your research illuminates so much of Cleveland's history. I love your blog, all photographs. I was in Cleveland and went to study at CSU, for 3 years. Now, I'm back to my country..and I miss Cleveland so much. I still have a question about first photograph. How come the Trinity Cathedral is in between the YMCA and the Walker and Weeks building. Should it be on Euclid Avenue ?? Yes, Trinity Cathedral is on Euclid. I'd made the assumption that the position was right, based on the fact that the church that I saw was much hazier than the YMCA and Walker and Weeks buildings, on Prospect and Carnegie, respectively. It now occurs to me that while distinctive, the outline is not that of Trinity Cathedral but of another, as yet unidentified church. Don't get me wrong about the position of Trinity Cathedral. I really love your blog, contents, and all photographs. All of them make me really miss Cleveland. I can say it's my home. I lived in Heritage (YMCA) for 3 years. I love to see it in the photograph like that one, and love to see it on your blog, as well. Thank you, again, for a nice work on your great blog. Am I also seeing old trolley tracks in the street? Yes, those are streetcar tracks. In the second photograph, you can see a streetcar.